Our Brand New Crystal Lazy Susans, perfect for any event, weddings, receptions, corportate dinners, and even birthday parties. 8 Serving Bowls complete with serving spoons, our state of the art servicing lazy susan is perfect for any event, Has 4 Drinks sections and also a space to put any centre piece. 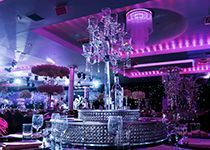 It comes with a complete crystal finish to create a sparkle on each table to make them stand our within your wedding venue. Each stand rotates to u won’t have to leave your seat to get served. It can be used by your wedding caterers to serve your lavish meals in ultimate style and perfection.